Title: Westbound with an old home road unit. Description: A westbound stack train with a nod to the lines heritage rolls past the exit at McNary. Description: A westound stack train rolls through the sagebrush heading for the west coast on the former SP Sunset Route. Description: UP SD70 4006 going north over the old ACL bridge north of Manchester, Ga. Description: I was visiting a nearby museum with my family, and didn't expect to take any train pictures. I heard this one coming, so I excused myself, dashed over an embankment, and caught this mixed merchandise pulling into Hagerstown, MD. 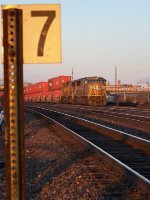 A UP SD70M is on the lead with a BNSF C44-9W following. Description: Rochelle Railroad Park. EB Generator Movement. Description: Light power heading for Boone. Description: A UP 18th Street Yard Crew wyes 9 Locomotives of various models. I'd still settle for 9 SD40-2s instead. Description: Pulling out of the west end of UP Neff Yard is UP Train IDULB 05 after doing its setout and pickup at the ramp. Description: UP SD70M 4006 leads a stack transfer into Clyde Yard. Description: UP SD70M 4006 arrives at Clyde Yard. Description: The DPU units on this outfit were BNSF 736, UP 6615 and BNSF 5364. Description: UP 4006 leading a NS stack train out of Fla.